Each painting captures and freezes a moment in time. Each moment brings forth a memory or mood that is both nostalgic and unforgettable whether it is a helmet worn in the championship game or a patchwork quilt, hand stitched by your grandmother, or simply an old jar or crock that brings back a place or time or special person. The great thing about the high school game is that it is the very top level of purely amateur football. It is the level where an untried kid can suit up and go out on the gridiron to test himself. Beyond are college players lured by scholarships and dreams of playing professionally. Beyond that are the pro’s who are wrapped up with wealth and fame. In this little corner of the world the North Davidson Senior High School “Black Knights” are always the team to be reckoned with. They are always tough, always competative, and always a winner even if the score might go the other way. The battered helmet used as subject matter belongs to Quarterback Jeffery L Nicholson, Class of '84. This small tribute was painted by Dempsey Essick, one of the top painters in North Carolina and, coincidentally, a former Black Knight halfback/defensive end (number 30) and graduate in the class of 1972. Go Knights! Folks in David County may remember this old-fashioned treat when October rolls around. That’s why artist Dempsey Essick has chosen this delicious dessert as the focal point of “October’s Treat”. Sadie Naylor – “Granny” to her family – knew how to make persimmon pudding. She never made a dessert without Daisy Self-Rising Flour, made in Mocksville by J.P. Green Milling Co. The mill is still in existence, and is run by Mrs. Naylor’s grandson, Ralph. The mill was formed around 1836, when Davie County split off from Rowan County. When J.P. Green purchased it in 1911, he disassembled it from Dutchman’s Creek and reassembled it at its current location, 496 Depot Street in Mocksville, where it’s operated ever since. “The actual structure has been around a long, long time”, Ralph says. Mr. Green was an uncle of Granny Naylor’s husband, Floyd. In fact, the couple met when thay worked at the mill. Mr. Naylor later became a partner in the mill, and bought it outright in 1951. The Naylors called one another “Granny” and “Pappy”. Besides producing Daisy Flour, the mill also makes hush puppy mix, Liberty Cornmeal and Winner Feeds. If offers 24 kinds of poultry feed alone, Ralph says. The mill delivers its goods within a 450 mile radius to restaurants, fish camps, small country stores and small supermarkets. Ralph remembers his grandmother as a good cook and a hard worker, as well as someone who always took care of her family. He also remembers Granny Naylor’s persimmon pudding, although he admits his favorite dishes were her Irish potatoes and her biscuits. In “October’s Treat” it looks as if Granny Naylor is ready to make a recipe of persimmon pudding. A colander full of just-ripe persimmons awaits – no “persimmon pucker” here. There’s also a ladle and a pitcher of milk, along with Ann Page lemon extract, and of course, a five-pound bag of self-rising Daisy flour. All of these cooking utensils were owned by Granny Naylor, who died in 1994 at the age of 89. Because Granny Naylor was also known for her roses and other flowers as well as her cooking, a Ball jar filled with two perfect pink roses completes the scene. Mrs. Naylor’s daughter, Janie Cozart, now makes the dessert using her mother’s recipe. “It tastes just like Granny’s” says Nan Naylor, Ralph’s mother. “October Treat” is the second in a series of paintings based on settings in Davie County. The first piece was the Old Courthouse in downtown Mocksville, which was released in 1997. Dempsey hopes that his friends in Davie County – and elsewhere – will enjoy “October’s Treat”. "Bonny Baskets: A Set of Three"
Autumn is the time when nights are cool, the grain fields are golden and the limbs of the fruit trees bend almost to the ground under the weight of apples, peaches, and pears. It is part of the yearly cycle that guarantees food through the long days of winter. To celebrate nature's bounty, Dempsey Essick has created three paintings which depict baskets of apples, peaches, and pears, all fully ripened, juicy and freshly picked. The paintings are a matched set and, in a significant break with traditional print offerings, each set is numbered and issued as a single unit. 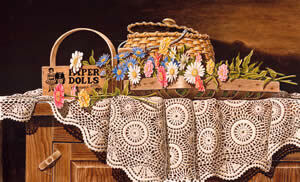 For his baskets, Dempsey chose and antique egg basket that belongs to his wife, Shelley, for the peaches. For the pears, he selected a basket of Margaret Hedrick's. Margaret's basket features an unusual node on the handle which fits under the rim and prevents the handle from being pulled out. 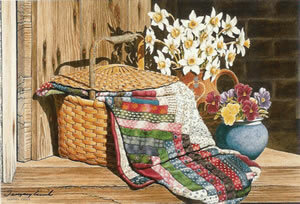 The apple basket is a twill woven pattern designed and made by Joyce Tetter. 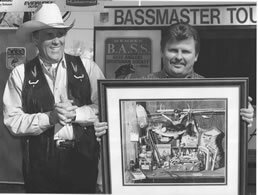 Collectors of Essick's work know that his subjects will be rendered with absolute fidelity to the originals. 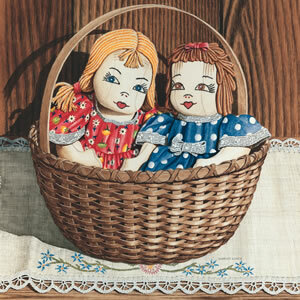 In "Bonny Baskets" (Bonny: Scottish for beautiful) they will not be disappointed. Each splint and stave has had as much attention as the perfectly toned and shaped fruit. The viewer might even get the illusion that she can detect the smell of peaches or hear insects buzzing around the pears. Framed together, "Bonny Baskets" form a stunning triptych. Framed individually, they offer some creative possibilities for a room or rooms. In either case, the prints are a worthy addition to Dempsey Essick's body of work. 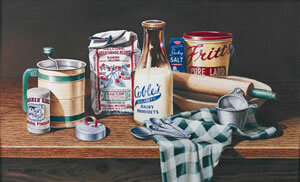 The ingredients of this painting are no strangers to anyone familiar with southern cooking. In fact, countless mornings have been spent mixing these various ingredients before the sun has even risen. Bake at 500 degrees for 8 to 10 minutes or until golden brown. The painting itself includes different historical items from Davidson County. 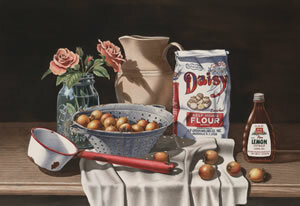 Dempsey has selected a unique group of local memorabilia for the painting "Timeless Recipe." A Coble Dairy milk bottle, a Fritts lard can, a Welcome Mill Flour bag, and a biscuit cutter from our friends at the Fancy Pastry Bakery, are the main components. 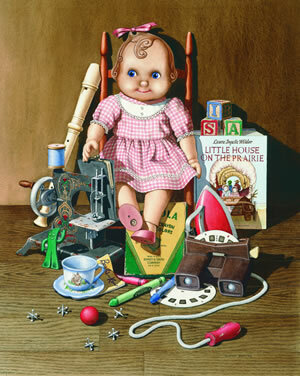 An antique sifter, dough bowl, baking powder can, and salt box, are also incorporated into the painting. Dempsey Essick is not a person to feel let down after the summer solstice when the sun sets a little sooner and each day gets a little shorter. For Dempsey, the late summer is a time when geraniums bloom and the Jonathan-Red apples and figs out behind Carolyn Phillips' and Aunt Sallie Parnell's houses are ripe. Carolyn is Aunt Sallie's daughter and she lives next door to her mother. 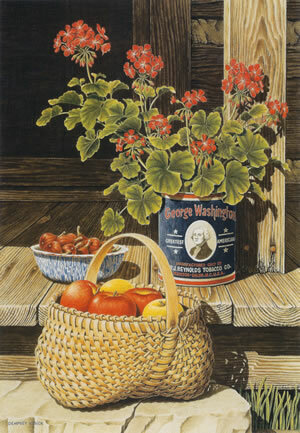 She introduced Dempsey to the subtle flavor of ripe figs when he was working on his painting, "From Aunt Sallie's Loom". Since then, one of his most enjoyable summer past times is to sit on the porch of the old log house that Carolyn and her late husband, Otis, moved to the property. There Dempsey revitalizes his creative spirit with fresh figs while listening to the afternoon song of the mocking birds and wrens and the drone of june-bugs in the nearby bushes. For "Summer's Treat," Dempsey has arranged some of his favorite things on the porch of the Phillips' log house. In the foreground is a handwoven egg basket filled with Jonathan-Red and Golden Delicious apples from Carolyn's trees. The enamelware pan just behind the egg basket was a gift from another dear friend, Miss Jane, "Miss Jane's Wash Day" - 1991. The figs, like the apples, were picked from Carolyn's bushes. To dominate the scene and provide a color contrast, Dempsey has used an old cut-plug tobacco can as a container for a blooming geranium. 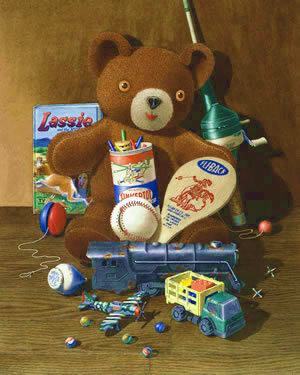 Dempsey Essick's great talent is his ability to capture the natural sparkle in any object he paints. His paintings are more than just pretty pictures; they are moments in time that stimulate memories in those that view his work. His rendering of the apples and figs in "Summer's Treat" is without fault and his geranium displays the translucent quality of the actual flower. The texture evident in the weave of the egg basket as well as the grain of the wood on the porch are the result of hours of very meticulous brushwork which has become an Essick hallmark. "Summer's Treat" is an excellent example of Dempsey Essick at his best. North Davidson Senior High School alumnus, Dempsey Essick, has created an intricately detailed collage of sports artifacts to pay homage to the school's long-time basketball coach and athletic director, Pete Jones. On viewing the painting the eye immediately goes to the snapshot of Pete Jones who seems to have gathered around him the mementos of a career spent guiding young boys and girls on their road to adulthood. 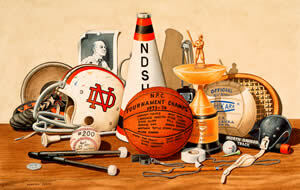 The central grouping includes the North Piedmont Conference Tournament game ball from 1973-74, a state championship baseball trophy, the softball used when the girls team won their 200th victory, and sitting next to a cheerleader's megaphone, a battle scarred football helmet which bears the colored bruises of each of the Knights' conference rivals. There are two batons, one for twirling and one for the track relay team. The rest of the paraphernalia runs the gamut from a trainer's roll of adhesive tape and a score keeper's pencil to a golf ball, a wrestler's ear protector, a volleyball, a tennis racket, a discus, soccer shoes and the sticks to beat a big bass drum. 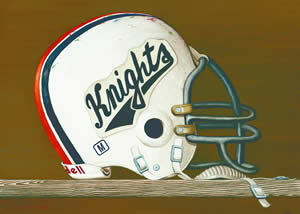 The sum total of Pete Jones' life as the leader of the Knights is not to be found in the artifacts of the various sports or the columns of numbers indicating wins and losses. Regardless of the score on any particular day or in any particular game, the mark of the man is in his impact on the young men and women who have learned to win with grace and lose with dignity. 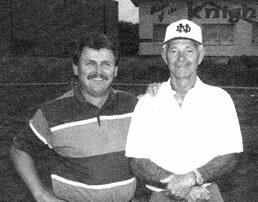 The hundreds of students who have learned the discipline of persistence, how to set a goal and attain it whether it be in the athletic arena or the arena of life, is the true legacy of Pete Jones. On that ultimate scorecard all the Knights are forever winners. Artist Dempsey Essick, educated in the Davidson County Schools, created this original piece of art used on the colorful dust cover of the book that describes the history of the first 150 years of public education in Davidson County. 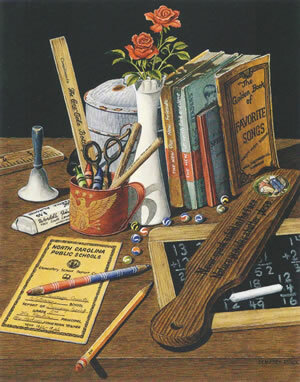 Did you notice that the report card featured in the painting is Dempsey’s? To celebrate the twentieth anniversary of the founding of the North Carolina Magistrates Association, Dempsey Essick has created a special release available only to the Magistrates. 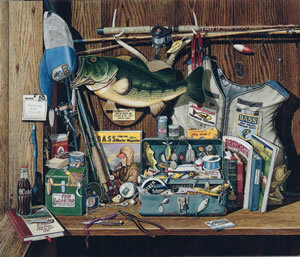 Dempsey's portrayal of the corner of a typical Magistrates desk captures the essence of the office that has been called, "The front line of the courts." The viewer first notices the national and state flags in close proximity to a worn Bible, both symbols of truth and duty. Then the eye discerns a graphically pleasing red, white and blue color bias in the reference volumes with their tattered covers and paperclip index markers. A coffee cup filled with lollipops along with chewing gum and antacid tablets complete the picture, leaving a lasting impression of a very human and dedicated person in service to the citizens of North Carolina. 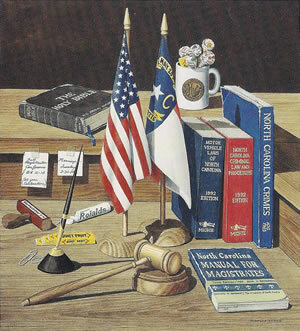 When he was first approached about doing a painting to commemorate twenty years of the North Carolina Magistrates Association, Dempsey was in a quandary. The problem was to put something in the painting that would be representative of each of the hundreds of Magistrates scattered through a hundred counties from the Blue Ridge Mountains to the Outer Banks. His choice of a work station with reference books and personal items that would be familiar to every Magistrate was the ideal solution. "The Magistrate" illustrates Dempsey's devotion to detail as well as his unexcelled draftsmanship and control of color. The realism in every line, from the wood grain of the desk to the ink smudges on the rubber stamp, are hallmarks of an Essick painting.